Back in 1969 Porsche was about to make a lasting impression on the world with the introduction of the sporty, mid mount 4 cylinder boxer engine, two seater Porsche 914. The design of the 914 was the result of the Porsche and VW working together to produce a new sports car for each of the companies. VW was looking to find a replacement for the Karmann-Ghia and Porsche was looking to use the 911 components but get a fresh new model. In Europe Porsche took the 914 body and finished it as the 914/6s while VW took it and finished it as the 914/4s. When marketed in North America both were sold as the Porsche 914. The 914 did not look like any other Porsche on the market. It featured pop up headlamps, flat deck lid over the rear engine, no backseat, and a vertical rear windshield. The low profile seats mean you are almost sitting on the floorboards and the firewall is located right at your back. There’s nothing fancy about the inside, in fact it is very basic. But it also has all the equipment you’ll ever need. It features a nice large tach which remained popular in many models. It has the same transmission that’s used in the 928 where you’ll find first down and over to the left. The suspension is hard, the car rides low gripping the road, and the steering is nice and tight. This is a really sporty little car and when the suns out and the winds warm you can pop the targa top off, roll down the windows, and relax. The flat 4 cylinder mid mount was available in a 1.7 L providing 80 HP, 1.8 L providing 79 HP, and 2.0 L providing 95 HP. All engines come with a 5 speed manual transmission. It has the independent front with lower control arms, anti roll bar, spring struts. The independent rear has transverse torsion bars and anti roll bars. Wondering what kind of performance this little gem is capable of? You’ll be just a little impressed. The 2.0 L used in the 1973 is probably the most popular of the three engines released. It’s a blast to put the petal to the metal and listen to the sound of that rpm band and oh yes let’s not forget the power. From 1970 to 1972 the 914-6 was released but it didn’t last very long with less than 3500 actually produced. There were also a small number of 914-6 GTs produced at the same time. They were given the higher performance 911 engine and suspension designed for the race track. 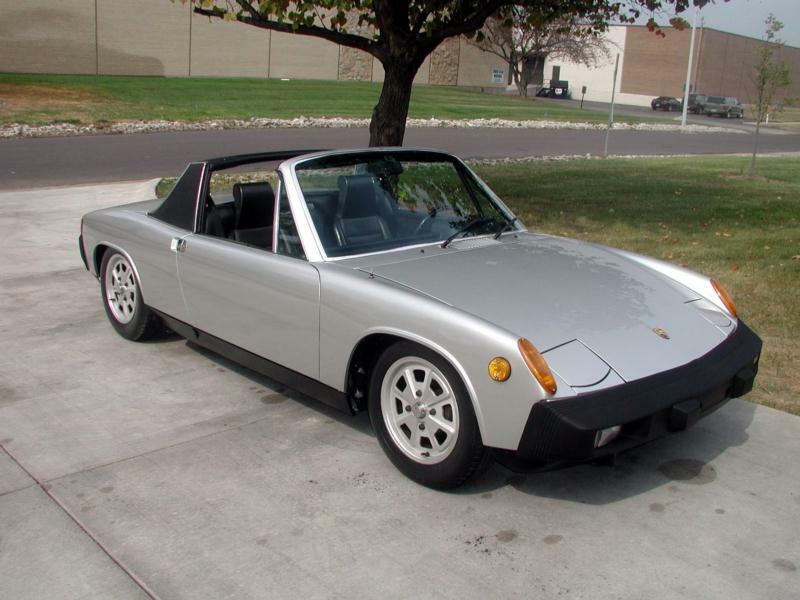 The 914-6 was agile with quick acceleration and good handling and breaking. In fact in many aspects it was considered superior to the 911. To drive it felt much like the 914-4 but in the upper RPM it definitely had more punch. 1974 the cars destined for North America saw the introduction of the 1.7 L engine which was bored to 1.8 L. It was combined with the Bosch fuel injection system for the emissions control required in North America. 1975 saw the end of an era when production of the 914 was ended. Eventually it would be replaced by the 924 and the 914’s 2 L engine was continued in the 912E considered a level entry model. When it comes to cool and “gotta have” the 914 definitely fits the bill. This is a great little sports car that’s nice and peppy, has great handling, and lots of snap. And with today’s high fuel costs it’s a real treat in that department too. You do need to watch for rust though. It is the biggest enemy of the 914. If you love the look of the sports cars from the 1970’s, understand the value of a Porsche, and like to stand out in a crowd the Porsche 914 is definitely a car to consider. So is this the car for you?